THE WRITING BUDDHA - Opinions | Books | Movies: 1000 Kilograms of Goa by Rohan Govenkar (Book Review-4*/5) !!! 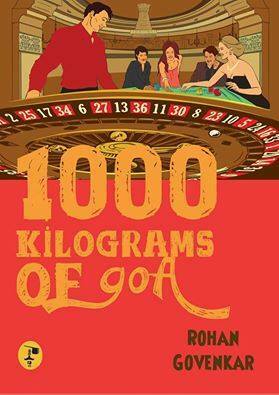 1000 Kilograms of Goa by Rohan Govenkar (Book Review-4*/5) !!! It was almost after 15 days that I picked a book to read as finally I realized that the countdown has begun for the year to finish and I am still left with 6 books of my target 60. And I picked up debutante, Rohan Govenkar's "1000 Kilograms of Goa". I found the title quite weird and unusual and therefore thought of giving it a read. Also the name of a debut author always catches my attention. I love reading work of a person with whom I have no attachment as a reader and thus getting surprised. Well, occasionally! Sometimes I end up getting shocked. And I can proudly claim that my last phase of reading journey of this year got a good start with this book which is such a great thrilling experience that it doesn't allow you blink even once for 230 pages of only fun, amazement, suspense, twist and turns, romance and everything done in a greatly balanced way. Rohan has a very authentic skill of writing which makes him arrange words in his own way and serves a new reading experience for the readers interested in reading Indian authors. The characterization of each one in this book is perfectly done as it was very essential otherwise it would have become half-baked failed dish. I also loved how the author kept the romance as just another angle to the book rather than romanticizing the basic plot of this story. The magic starts right from the first conversation between the friends when a piece of history is shared in the best written form. After that, it becomes more exciting when you realize that the mission gets accomplished almost half way in the book. But what happens after that makes this book not an ordinary thriller but more than that and something which becomes recommendable. The story is beautifully crafted and it allows you to think even when it becomes fast pacy sometimes. The locations are nicely described as it allows your imagination to build the same in your thoughts which makes it more easy for you to follow the story weaved into it. The breaking into the mansion scene and the way it is handled by the friends is nicely written. I wish to read that part once again. The second half is what does justice to the first half of the book as it takes the story to another level. And the anti-climax is beautifully done. As drawback, I only felt that the last part is little overdone by the author to prove the book morally and politically correct but it wasn't needed and he should have closed the story little early rather than giving a whole chapter to what the main protagonist did. Rest, it's all fine. Go and get this book. I give the effort 4 stars out of 5 and I strongly recommend the same.